While the Beverage Ordinance is under consideration by the King County Council, it goes through a legislative process that allows citizens to propose recommendations and amendments. Council members can also sponsor amendments to the Ordinance. A very small number of individuals would like to see the Sammamish Valley commercialized, from Redmond north to Woodinville, and in some cases all the way east to Avondale Rd along NE 124/128th St. What may seem like an small-scale argument over a few tasting rooms is actually the tip of the iceberg of a broader vision for intensive commercial development in all parts the Valley - not just in those areas zoned Rural but also the Agricultural Production District itself. The drip, drip, drip of commercial development is how the Sammamish Valley can become another Kent Valley if we do not protect our Rural Areas and farmland and encourage smart growth of the Woodinville wine tourism industry. The following recommendation is part of a public record submission to the King County PRE Committee meeting on July 17, 2018 in response to the Ordinance. The individuals listed below the recommendation are the people who submitted it - including Cliff Otis from Matthews Winery and Greg Lill from Delille Cellars, both cited as Code Violators. You can see there are few if any limits to their imagination for the commercialization of the Valley. 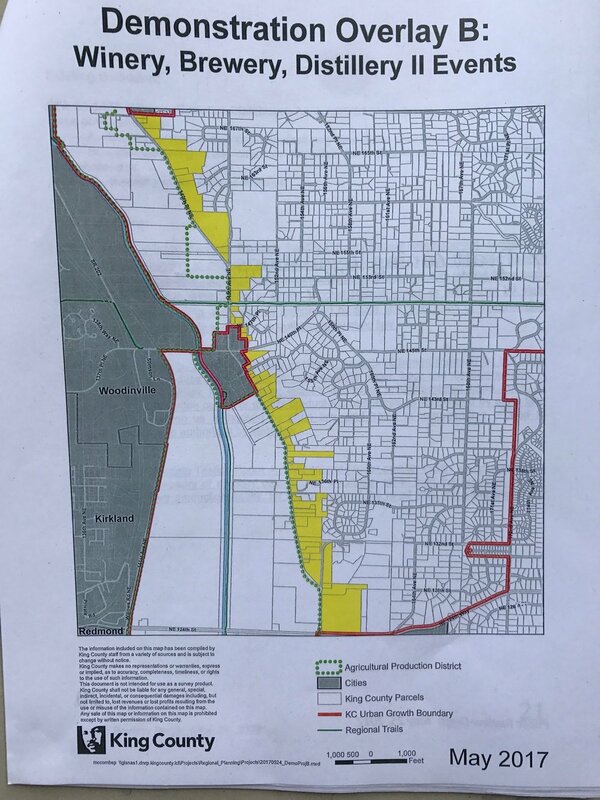 In May 2017 King County proposed that the commercial overlay extend all the way from downtown Woodinville south to NE 124th St on the Redmond Urban Growth Boundary (see the map below). While the current Ordinance shows the overlay running from the Woodinville Tourist District at the Hollywood Hill roundabout south to NE 124th St, Council member Kathy Lambert has already submitted an Ordinance amendment that would extend the overlay north past the Tolt Pipeline Trail.